viaLibri ~ Oeuvres completes de Buffon. Avec la Nomenclature el la Classification de Cuvier, et annotees par M.Flourens. Oeuvres completes de Buffon. Avec la Nomenclature el la Classification de Cuvier, et annotees par M.Flourens. Paris Garnier Freres - 55 1853 - 12 Volume. 27,5 x 19 cm. Green Maroquin half leader. Front and back board rubbed. Georges-Louis Leclerc, Comte de Buffon (* 7. September 1707 in Montbard;  16. April 1788 in Paris) war ein französischer Naturforscher im Zeitalter der Aufklärung. Sein offizielles botanisches Autorenkürzel lautet Buffon". 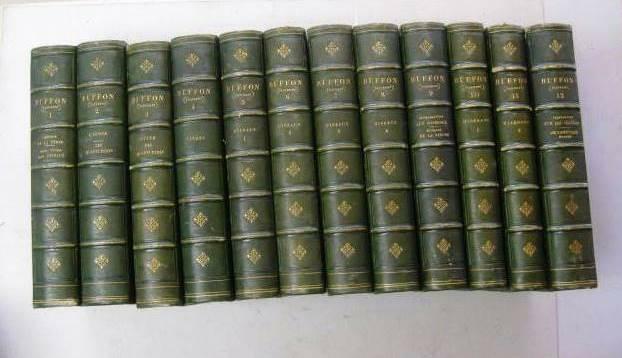 12 volume with only 146 contemporary colored lithographs ( of 161). With some loose pages and some water stains out of text. Still a very nice set in contemporary binding. --- R. Heim, 1952 "Buffon, Les grands naturalistes Français" p. 232; Hoover, 192; Nissen ZBI, 704.